The Lockheed F-94 Starfire was the United States Air Force's first operational jet-powered all-weather interceptor aircraft. It was a development by Lockheed of the twin-seat T-33 Shooting Star trainer aircraft. Built to a 1948 USAF specification for a radar equipped interceptor to replace the aging Northrop F-61 Black Widow and North American F-82 Twin Mustang, it was specifically designed to counter the threat of the USSR's new Tupolev Tu-4 bombers (reverse-engineered Boeing B-29). The Curtiss-Wright XF-87 Blackhawk had been designated to be the USAF first jet night fighter, but its performance was sub par and Lockheed was asked to design a jet night fighter on a crash program basis. 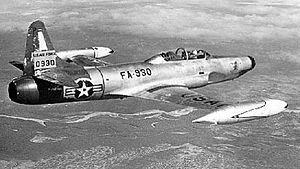 The F-94 was derived from the TF-80C (later T-33A Shooting Star) which was a two-seat trainer version of the F-80 Shooting Star. A lengthened nose area with guns, radar and automatic fire control system was added. Since the conversion seemed so simple, a contract was awarded to Lockheed in early 1949, with the first flight on 16 April 1949. The early test YF-94s used seventy-five percent of the parts used in the earlier F-80 and T-33As. The fire control system was the Hughes E-1, which incorporated an AN/APG-33 radar (derived from the AN/APG-3 which directed the Convair B-36's tail guns) and a Sperry A-1C computing gunsight. This short-range radar system was useful only in the terminal phases of the interception, most of the operation would be directed using ground-controlled interception as was the case with the earlier aircraft it replaced. 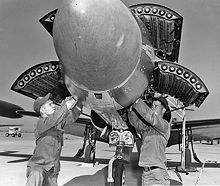 The added weight of the electronic equipment soon dictated that a more powerful engine be fitted, the afterburning Allison J33-A-33 centrifugal-type turbojet replacing the standard J-33 fitted to the T-33A. The F-94 was to be the first US production jet with an afterburner. The J33-A-33 had standard thrust of 4,000 lbs, and with water injection this was increased to 5,400 lbs and with afterburning a maximum of 6,000 lbs thrust. The combination of the new, larger engine and the electronics gear reduced the internal fuel capacity; removable tip tanks were added to compensate. The YF-94A's afterburner had many teething problems with its igniter and the flame stabilization system. The initial model was the F-94A. Its armament was four .50 in (12.7 mm) M3 Browning machine guns mounted in the fuselage with the muzzles exiting just behind the radome. Two 1,000 lb (454 kg) bombs could also be carried, giving the aircraft a secondary fighter bomber role. 109 were produced. The subsequent F-94B, which entered service in January 1951, had upgraded and more reliable electronics and engines, as well as a new ILS. 356 of these were built. The F-94C Starfire was significantly modified from the early F-94 variants; in fact, it was initially designated F-97, but it was decided to treat it as just a new version of F-94. Initially, USAF interest was lukewarm, so Lockheed funded development themselves by converting two F-94B airframes to YF-94C types for evaluation. To improve performance, a totally new wing was fitted, much thinner than the previous one and a swept tail surface. The J33 engine was replaced by a more powerful Pratt & Whitney J48, a license-built version of the afterburning Rolls-Royce Tay which dramatically increased power, giving a dry thrust of 6,350 lbs and with afterburning approximately 8,750 lbs of thrust. The fire control system was upgraded to the new Hughes E-5 with AN/APG-40 radar in a much larger nose. The guns were removed, replaced with an all-rocket armament mounted in a ring around the nose radome. The rockets were loaded into flip-up panels on the sides of the nose, and fired by opening four panels just behind the radome. According to test pilot Tony LeVier, the F-94C was capable of supersonic flight. The F-94C was the only variant to be officially named Starfire. With time, the entire F-94 family has adopted the name. An F-94D model was proposed as a, single seat, fighter bomber, with bombs and rockets under the wings. A single prototype was built, but the model was not accepted for production. The prototype was later used as a testbed for the 20 mm (.79 in) M61 Vulcan cannon subsequently used on the F-104 Starfighter and many others. In March 1951, F-94Bs were sent to combat in the Korean War, where they equipped the 339th, 68th, 4th, and 319th FIS. The type is credited with several air to air victories, including the first jet vs. jet night victory. One F-94 is listed as lost due to enemy action, six more to non-enemy causes on combat missions, two were declared as missing on a combat mission and three were lost in accidents. Another early detachment was the 59th Fighter Interceptor Squadron, (all-weather, night-fighter interceptor,) which was sent to Goose Bay, Labrador in November, 1952 and placed under the control of Northeast Air Command (NEAC). One flight from the 59th FIS was kept at Thule Air Base to back up the DEW Line. The F-94B remained in USAF service through 1954 before being transferred to the Air National Guard. In ANG service, some were modified with a pod under each wing for two additional .50 in (12.7 mm) machine guns, bringing the total to eight. The first production F-94C aircraft were delivered in July 1951, 387 examples being delivered before May 1954. The largest problem discovered in service was that of the nose-mounted rockets which blinded the crew with their smoke and fire. The most severe problem of firing the nose-mounted rocket was that the exhaust could cause a flameout of the jet engine and could lead to the loss of the aircraft. Mid-wing fuel and rocket pods were added, each holding 12 rockets. Most of the time, the nose rockets were not installed, and the mid-wing pod rockets were the sole armament. This version of the aircraft was extensively used within the Semi Automatic Ground Environment (SAGE) air defense system. The F-94C was retired from USAF service in 1959, as newer and more capable interceptors entered service. Air National Guard units retired their F-94s a year later. YF-94 TF-80Cs converted into YF-94 prototypes, two built. F-94A Initial production version, 110 built. YF-94B One F-94A modified with new flight director, modified hydraulic systems and two enlarged wingtip tanks. F-94B Production model based on YF-94B, 357 built. YF-94C F-94Bs modified with Pratt and Whitney J48 engine, leading edge rocket pods and swept tailplane, originally designated YF-97A, two modified. F-94C Production version of the YF-94C with longer nose, rocket and gun armament removed and provision for underfuselage JATO rockets, originally designated F-97A, 387 built. EF-94C Test aircraft for proposed reconnaissance variant YF-94D Prototype single-seat close support fighter version based on the F-94C, one partly built but construction was abandoned when program was cancelled. F-94D Production version of the YF-94D, 112 on order cancelled, none built. YF-97A Original designation of the YF-94C. F-97A Original designation of the F-94C. A number of F-94s survive. The original YF-94A (s/n 48-0356) in storage for the Air Force Flight Test Center Museum at Edwards Air Force Base in California. For many years it was displayed at Lackland AFB, Texas. F-94A (49-2498) is on display at the National Museum of the United States Air Force at Wright-Patterson Air Force Base near Dayton, Ohio. It was transferred from active inventory to the Museum in May 1957. The YF-97/F-94C prototype (50-877), is on display at the Syracuse, New York airport. A well-preserved F-94C (s/n 50-0980) has been on display for many years at the National Museum of the United States Air Force at Wright-Patterson Air Force Base near Dayton, Ohio. It is displayed as 50-1054. F-94C (51-13560) is currently on display at Minnesota ANG Museum at Minneapolis, Minnesota. F-94C (51-13563) reportedly displayed in Minneapolis, Minnesota. F-94C (51-13570) is on display at the Ironworld Discovery Center in Chisholm, Minnesota. It is marked as 51-13560, the plane in the MN ANG collection. F-94C (51-13575) is on outdoor display at the New England Air Museum in Windsor Locks, Connecticut. Some report this ac was destroyed in 1978 tornado and replaced by 51-5520. F-94C (51-5576) is on display in Bessemer City, North Carolina since 1988. Formerly displayed outside VFW Post 670 in Fayetteville, NC. F-94C (51-5605) is displayed by the ND ANG at Hector International Airport, Fargo, North Dakota. F-94C (51-5671) is on display in the "Erie County Memorial Gardens" cemetery at Erie, Pennsylvania. It was first put on display in 1971 and subsequently left to deteriorate. It was refurbished in 2005. Data from RAF Flying Review "TECHNICAL GEN"
Francillon, Ren� and Kevin Keaveney. Lockheed F-94 Starfire. Arlington, Texas: Aerofax, Inc., 1986. ISBN 0-942548-32-9.